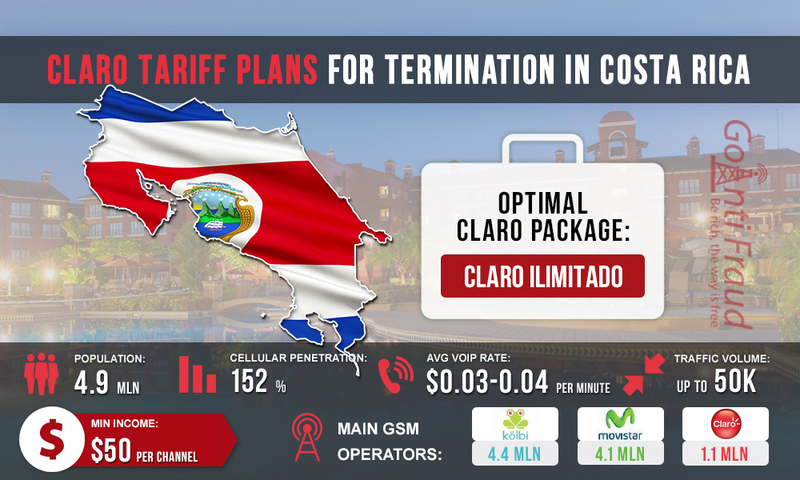 In Costa Rica, you can make good money on terminating international calls if you select a profitable tariff plan. Claro is the third largest mobile operator in the country as its subscriber base consists of 1.1 million users. It entered the market recently and provides excellent GSM coverage in the Central Valley area. In the rest of the territory, the signal may not be too good. To terminate sip voice traffic, you can use one of the prepaid Claro packages. Claro Chip. When buying this SIM card, the subscriber receives a bonus package called XS Superpack, which includes 20 free minutes for calls. Claro Kit. When the card is activated, the subscriber gets benefits and bonuses for using the mobile Internet. Claro Chip will be the best option for terminating traffic. If you spend about 2 dollars to buy a SIM-card, you can immediately use the XS Superpack package, which provides 20 bonus minutes for on-net calls. There are other Superpacks tariff plans represented by 2 lines - "All inclusive" and "Minutos". "All inclusive" is not too good for terminating calls because it is more focused on services that provide access to the mobile Internet and SMS-services. These packages include 20 to 120 voice minutes, while they are quite expensive. But Superpacks Minutos can be used for 1-3 days, so they are cheap, besides, they provide minutes for calls only. The most suitable package from this line is Claro Ilimitado, which provides a 90-cent subscription fee. The subscriber gets a no-limit for 1 day, that is, the possibility to call an unlimited number of times to the numbers of Claro. Using this tariff plan, you will spend $0.9 per day to connect the service and $2 to purchase a new SIM-card. At the same time, using the Claro Chip offer, you will get 20 additional free minutes. If you are going to terminate for 5 hours a day, a minute of conversation will cost you $0.003 + 20 bonus minutes a day. Terminating via Claro Ilimitado, you will make about $200 from 1 channel of VoIP equipment.